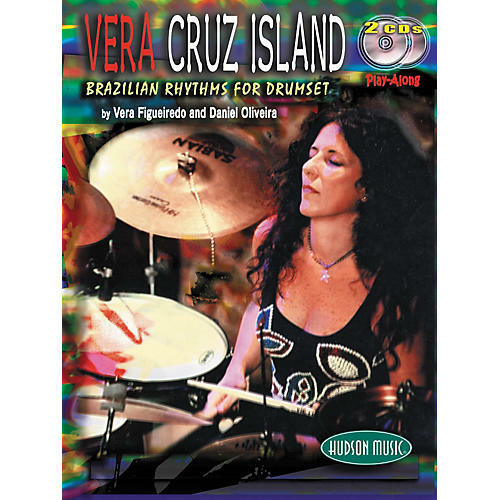 Written by leading Brazilian drummers, Vera Figueiredo and Daniel Oliveira, Vera Cruz Island is a book and double CD package offering progressive drum lessons that teach a complete system for applying Brazilian rhythms to the drum set. This multimedia drum education package is based on Figueiredo's Vera Cruz Island CD, which features original compositions based on authentic Brazilian influences and a host of top Brazilian musicians as well as guest appearances by drummers Dave Weckl and Dennis Chambers. The drum tutorial include a copy of the full-length audio CD and a second, minus-drums, play-along version of the disc, plus a 106-page book. The Vera Cruz Island book contains examples of traditional and contemporary Brazilian forms such as Maractau, Baiao, Bossa Nova, Choro, Chamam, and several types of Samba, plus detailed breakdowns, explanations and transcriptions of all the drum parts from the songs on the CD. This unique combination of musical and instructional content provides teachers and students with both an unprecedented insight into challenging yet popular Brazilian drumming styles and a straightforward method for adapting Brazilian rhythms and sounds to the modern drum set.